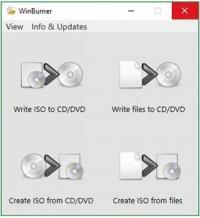 WinBurner is a free disc burning studio that’s both reliable and easy to use. With this tool you can write various types of files like music, photos, videos, documents, archives and so on, to CDs, DVDs and Blu-ray discs. Also, the program allows you to create and burn ISO images, as well as bootable or multisession discs. Regarding media files, it is possible to create video DVDs and audio CDs. For ISO images, besides burning them onto discs, the tool can create them from CDs and DVDs, as well as files stored on your computer. Keep in mind you will need .NET Framework installed on your computer in order to use WinBurner.